If you garden, you will know that the cost of buying new plants can get very expensive over time. But you don’t have to spend a lot of money to have a wonderful garden. 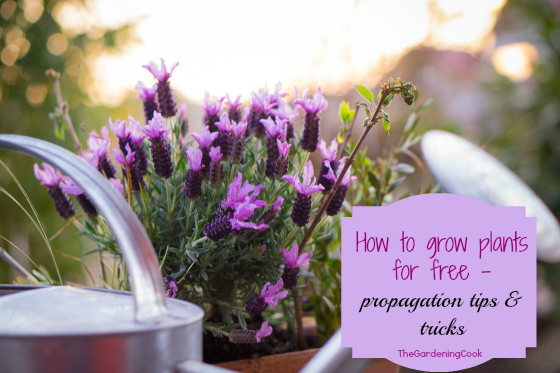 Just follow some of these plant propagation tips and you will have a whole slew of new perennial garden plants without the outlay of cash at the garden center..
Propagating plants also gives me new indoor plants for free in no time at all. I have 8 large garden beds at my home. There is no way that I could afford to fill them with retail plants. It is just not an option for me, nor is it really a desire. I enjoy getting things for free, so plant propagation is something that I love anyway. Plants from Cuttings One of the wonderful things about plants is that they will grown new plants from almost any part of an existing plant. All that is needed is a good soil-less planting mix and some rooting powder. Start with a healthy mother plant. New cuttings need bright light but not direct sunlight. Keep evenly moist throughout the process. Keep an eye on humidity. When roots have developed from the cutting, transfer them to pots with normal potting soil. This can take anything from a few days for easy to grow plants to months for stubborn ones. Healthy Plants. It is important to start cuttings with a healthy mother plant. Why give your new plant a hard start in life when you can make it easy with a good mother plant? Soil-less mix. Cuttings do best in a soil-less mix, since normal potting soil is too rich for the tender shoots. To make a good planting mix without soil, just combine 1 part of peat moss or vermiculiteand one part of perliteor builders sand. (affiliate links) Once established, they can be transferred over to normal potting soil. Poke a hole in the planting medium with a pencil before you add the cutting so that you don’t bruise the tip. Light matters with cuttings. A Grow light unit is a perfect choice and offers optimal conditions. 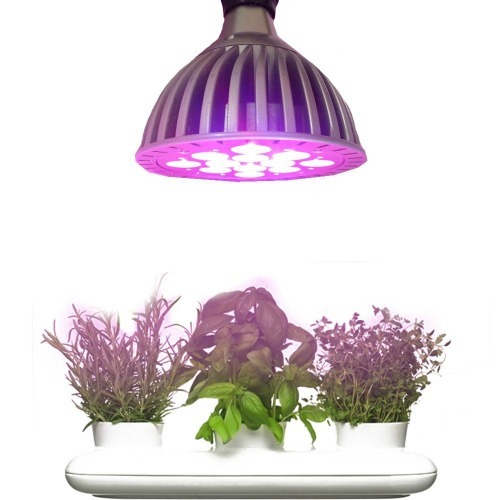 A good quality grow light will offer great heat dissipation and does not get hot to the touch. They are energy efficient as well. I recently had the opportunity to try an LED Grow Light from one of my sponsors GrowHobby and have to say that I am very impressed with it. Learn More About GrowHobby (an LED Grow Light and Garden Company) (affiliate link) Another great feature of a grow light is that they are not just for rooting cuttings. 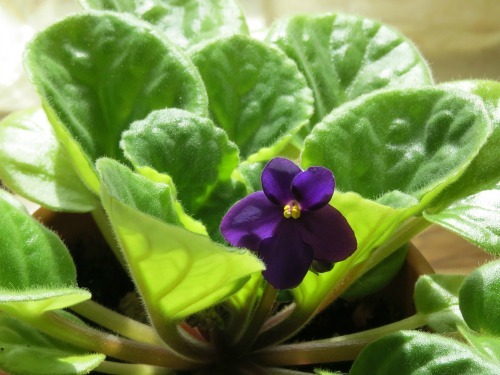 They can be used with starting seeds, to bring back an ailing house plant, and to give indoor plants in darker parts of the room more light than they would normally get. 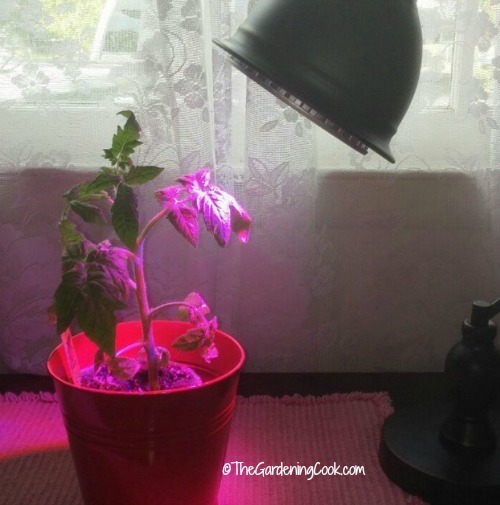 You can even use them to give light when you are growing herbs for use all winter long! Grow lights really are an all purpose garden tool. In this photo, my grow light is giving my tomato plant some extra TLC after being neglected while I was away for a few weeks. It perked up beautifully and is now growing outside. Humidity is important. New cuttings will dry out easily. 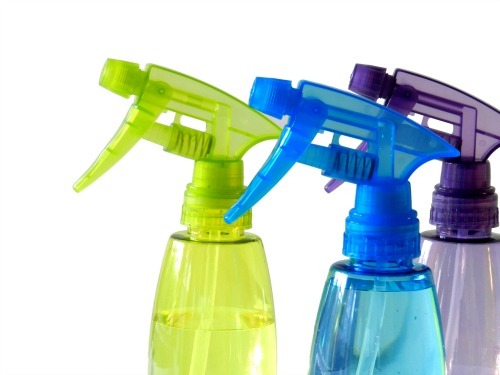 A plant mister works well to keep the humidity where it should be (no need for anything fancy, a spray bottle works fine – just don’t overdo the moisture. Cuttings need humidity, they don’t like to sit in water!) You can also cover cuttings until they are rooted by placing the whole pot inside a plastic bag. As I mentioned above, there are many types of cuttings – leaf, stem, softwood, and hardwood. All are propagated in much the same way, – cut a piece, dust with hormone power and insert in the planting medium. The main difference is what type of plants are best propagated with the different techniques and when you should take the cuttings. Great for succulents, and some houseplants such as African violets, gloxinias, primroses and some begonias. Any plant that has fleshy leaves is a candidate for leaf cuttings. Just cut a leaf from the mother plant, dust with hormone powder and insert in the planting medium. This type of cutting can be done anytime. 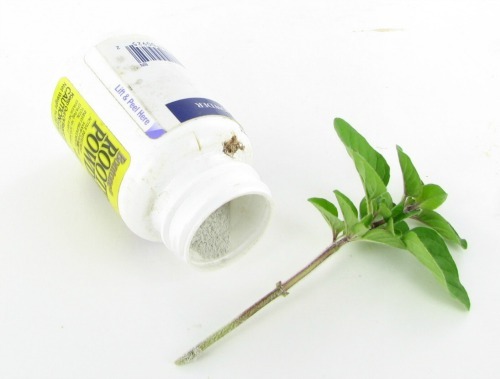 This technique works with many house plants, annuals and even some vegetables. I have done this with cherry tomato plants with great success. Why buy several tomato plants when you only need one? The main difference between stem and leaf cuttings is that a leaf cutting uses just one leaf, while a stem cutting has a piece of the stem with several sets of leaves attached. Just cut it off, dust with the hormone power and insert in the planting medium. Best done during the growing season of the plant. 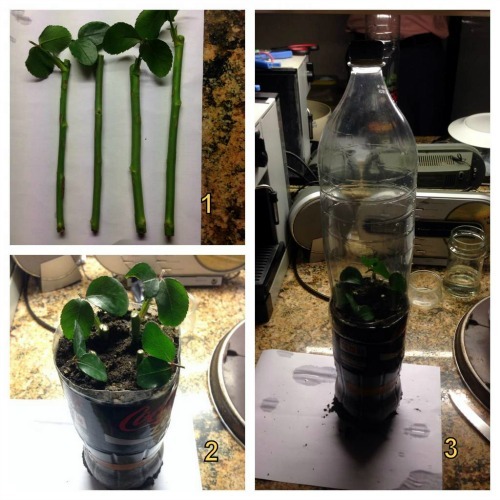 These rose cuttings show the cutting, then in soil and protected for humidity with a plastic bottle. I have a step by step tutorial showing how to take stem cuttings from a purple passion plant. You can check it out here. These are stem cuttings taken from new branches of shrubs that have not yet become woody. The best time to take softwood cuttings is from April thru June when the ground is somewhat wet. Healthy shoots that are neither too thick or too thin work best. Make a 2-10 inch diagonal cutting with a sharp knife or sharp pruning shears at least 1 inch below a leaf node, and include 2 or 3 pairs of leaves. Diagonal cuts give more room for roots to develop. Scrape a bit of the bark off, dust with the powder and insert in the planting mix. Roots will develop quickly but humidity is very important with softwood cuttings. 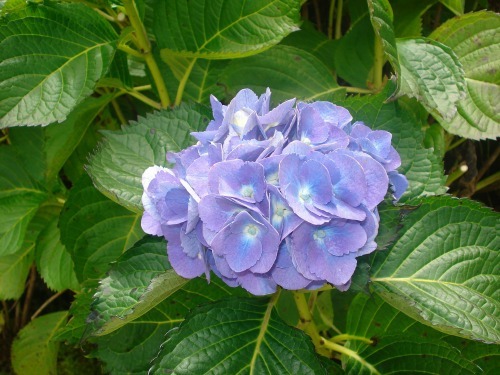 Hydrangeas are an easy plant to take from soft wood cuttings. These are cuttings are taken from plant stems that have become woody when the plant is dormant. The best time to take these cuttings is late fall. Take cuttings in a similar way to softwood cuttings but the trick here is to take many more than you will need. This is the hardest type of cutting to get to root. (if they will do it at all!) Once rooted, keep them growing over the winter and then place in the ground outside in the spring. 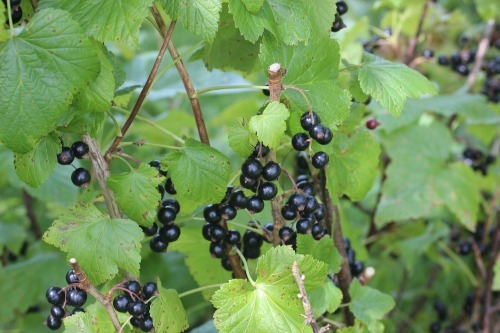 Grapes and kiwi fruits, and the currant family and gooseberries are good choices for hardwood cuttings. Offsets. 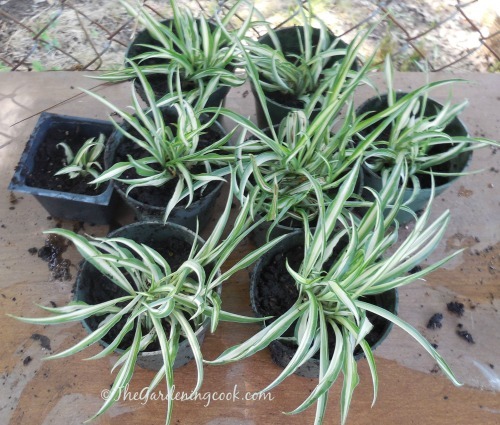 Many plants send up what are called offsets or “pups.” These baby plants are identical to the mother plant and can be separated and potted on their own. 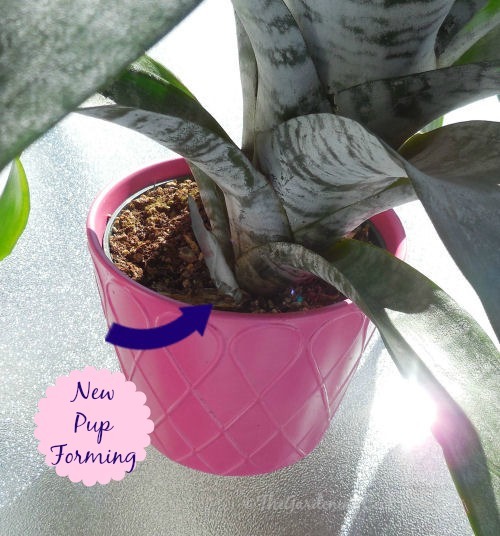 See my article on propagating bromeliads from their pups here. Runners. Lots of plants send out runners or baby plants. Spider plants and strawberry begonia plants are good examples. These are some of the easiest plants of all to grow into bigger plants. Just place them in pots, water and before you know it, you will have new plants that will rival the size of the mother. Planting from seed. Anyone who grows vegetables will know how frugal that sort of gardening can be. 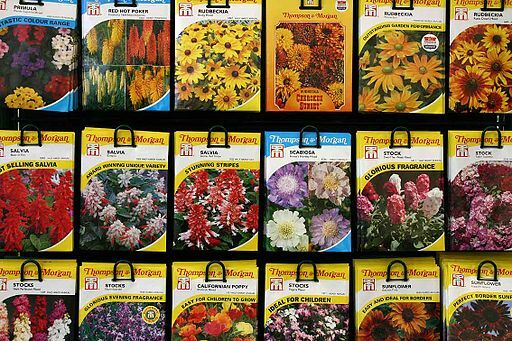 A whole packet of seeds is just a few dollars and will grow dozens of new plants. See my seed starting tips here. A grow light is especially helpful when growing plants from seeds. Peat pellets have a great soil mixture that is perfect for starting seeds. Combine them in a plastic greenhouse kit and you have the perfect seed starting project. See my tutorial on this topic here. Divisions. If left unchecked, most outdoor perennials will take over quite a large area in just a few seasons. Some will even have the crown die out in the center if left unchecked for too many years. This is where division comes into play. And dividing plants is so easy. You can often just use a sharp spade to give up a segment of the plant and move it to another place in your garden which has more room. And if you don’t have room for them, just plant them in fresh potting soil in pots and share with your gardening friends. I mentioned earlier that I have 8 garden beds. I started with one about 5 years ago and each of my successive beds has some divisions from the initial garden bed growing in them. Each one has their own theme but they also all share some similar plants. It is fun to watch how they grow in different soil and light conditions. 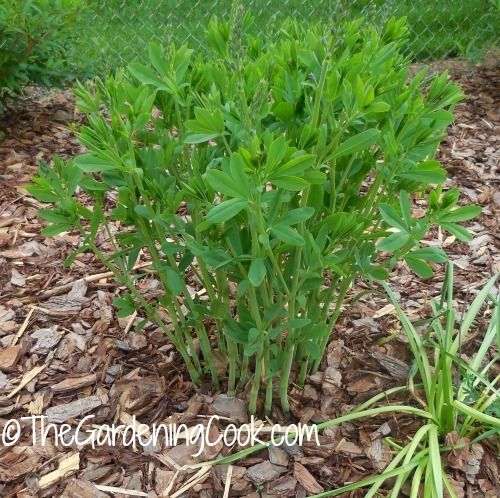 The Baptisia shown here was a tiny division of a large established plant. It is barely spring here and by mid summer this bush will be 4 feet tall! Bulbs, corms and rhizomes. There is nothing quite like watching a patch of daffodils, day lilies, tulips or irises get larger and larger year by year. Many bulbs are natualizers, meaning that the bulb that will not only return year after year, but will also multiply and spread. When growing naturalizing bulbs, be sure to let the foliage turn yellow before you cut it down after flowering. This will send nutrients to the bulbs and help them to spread for the next season. This stand of irises were originally planted around a well and were languishing. I dug them up, divided them and planted them in all my borders. I now have at least 10 times the irises and they are much more gorgeous than the original ones. Layering. This is one of the forms of plant propagation that I have had the least amount of experience with but it is still quite easy to do. Vines and woody stems take well to layering. With layering, you grow new plants without having to take any cuttings. 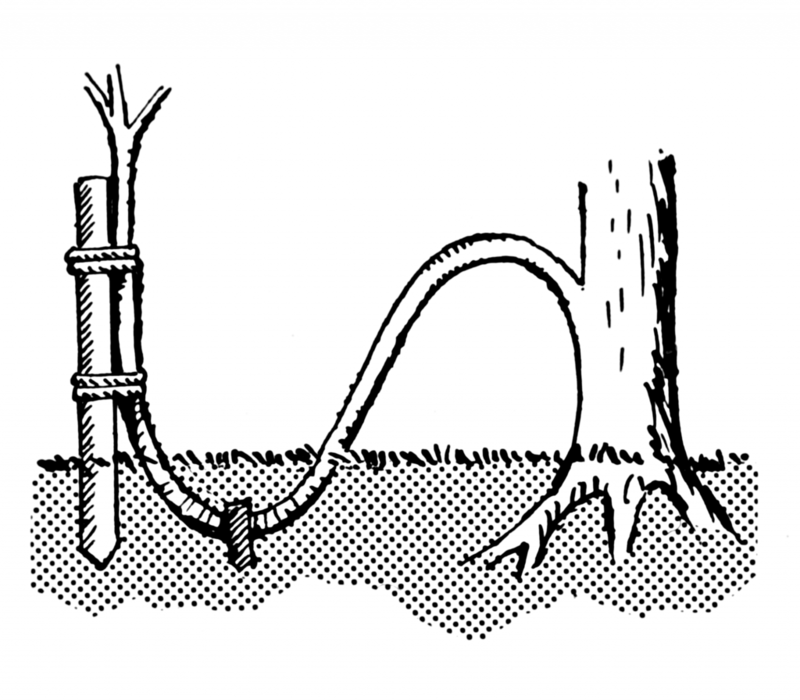 Basically, to layer, you bury a part of a stem or branch in the soil and new roots and shoots will form at this point. This method is often more successful than propagating from cuttings for shrubs, since the new plant can get water and food from the mother plant. Once the new plant is established with roots, it can be cut away from the mother plant and moved to another spot in the garden. My forsythia buses do this every year. If any part of the plant touches the ground, it will root very easily. (Spider plant and strawberry plant babies easily root this way too. Just pot them near the mother plant in another pot and separate when roots form on the baby.) This graphic shows the layering technique very well. Note: I received The grow Light pictured here in exchange for mentioning the product on my blog post. Nevertheless, I only recommend products that I feel will be of benefit to my readers. 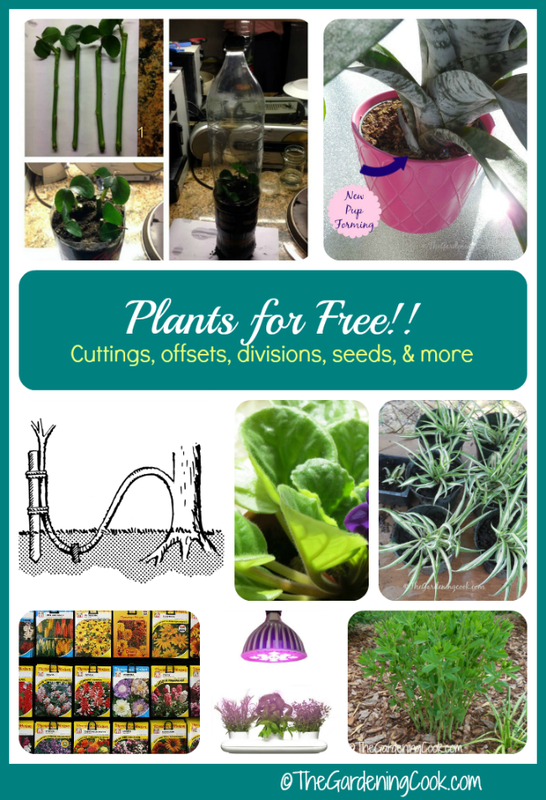 What have you done to get new plants for free, or almost no cost? Are there any plants that you find especially easy to propagate? Please leave your tips in the comment section below. I would love to hear your experiences! Images not attributed are public domain images from Pixabay and MorgueFile. See more photo sharing resources here. Those are hardy to about Zone 3 (really cold) so they would be fine. That’s all I grow now, those that are tough as nails! Great Information…I really need to give this a try! Great info plan to use it thank you! Great article. I was propagating rosemary and “sirih gading” (in Indonesian) yesterday. Can’t wait for another plant. Thank you. At first thanks a lot for sharing such an informative guide and I have pleased to get this blog page. I have gotten much information from your page. I love to garden like you but I have not enough spent money for my garden’s plants. I follow your all tips for that. I also use some led grow light for my indoor plants. It also helps me for quick plants grow. I will save your article links and I will share it with my friends. I hope they will be benefited by this topic because they are also love to garden like me. What is the best budget for building small garden indoor that can you suggest? Your tips are great. They inspire me a lot. Thanks. Hi Thomas. It’s hard to give an exact amount, since it depends on the price of plants in your area. What I did the first year, was to buy a few perennials at $6 or so (maybe 10 of them) and then filled in with annuals for summer long color. EAah year, I added more perennials as my budget allowed and used annuals just for pops of color. It took me about 5 years to fill in 3 large garden beds doing it that way. I also did a lot of division as I added beds to get the plants for free, and also cuttings of the annuals. Glad to year you enjoy my tips. Awesome Information…I really need to give this a try! Thanks for the tip on the mason jars Joseph.